Unit is suitable for 3/4 inch pipes. Once fitted, the pipe can continue to function under normal pressures and temperatures until a permanent repair can be made. The hallmark of this 3/4-inch gluing clamp is its durability and toughness: manufactured from high-quality materials, the handle and screw are nickel-plated for resistance to corrosion and wear. To keep clamped materials from moving around, Acme threads allow for maximum tightening power so everything stays snug. Repair your Faucet quickly and easily: replacement Lavatory Faucet Handles fits WALTEC Flotrol Faucets . JAG Plumbing Products strives to bring customers the best products in Canada and make them available on the best online shopping platform: Homedepot.ca - Owned and Operated in Ajax, Ontario, Canada, JAG PLUMBING prides itself on offering Home Depot Customers durable, high quality, non OEM replacement plumbing parts. 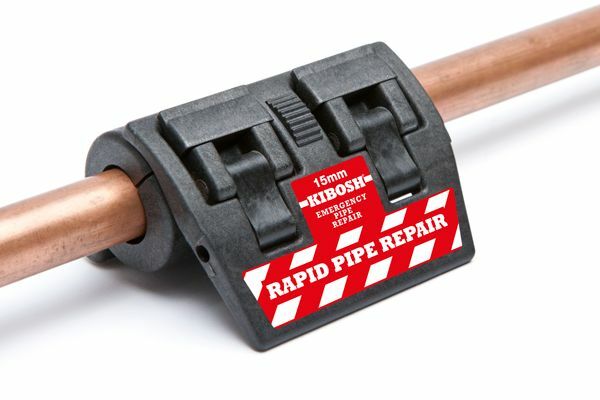 3/4 inch Emergency Repair Clamp Repair any pin hole, cracked or leaking pipes easily and economically with the KIBOSH Emergency Pipe repair kit distributed by JAG Plumbing Products. This innovative product, made in the UK, is a quick fix that allows you to temporarily repair a burst or accidentally perforated water pipe or leaky fitting with ease. JAG Plumbing Products brings on-line customers the best tools and repair parts. Experts in the field of plumbing repair parts; JAG Plumbing Products offers customers a selection of economic solutions for their every-day home plumbing repairs. The team at JAG Plumbing scours the world to bring The Home Depot customers unique, hard to find parts of the highest quality.